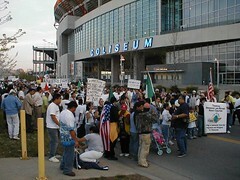 Nashville Metblogs » Si se puede! Wow, two protests in Nashville in as many weeks? Ah, the sweet smell of progress and protest. Thousands of people took to the streets tonight in a march from the Coliseum across the river to Legislative Plaza, sponsored by the Tennessee Immigrant and Refugee Rights Coalition. 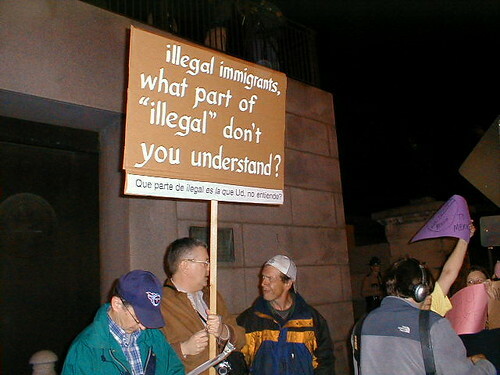 They were marching to protest some of the more idiotic and draconian immigration legislation currently in draft form — for example the bill that proposes to make the lack of legal immigration status a felony. The turnout was amazing — I am not any good with headcounts, but thousands of people showed up and marched, filling up legislative plaza and piling up all the way back to 4th or 5th. Various speakers took the stage to address the roaring crowd. They also closed the capitol again — same as they did during the ADAPT protests. How long before we hear complaints about how the protests were not productive because they “had” to close the capitol? No commentary necessary. Unfortunately I was out of battery life, so I didn’t get a picture of the lady screaming “GO HOME” at the top of her lungs. There are more pictures here — unfortunately I appear to be the world’s worst photographer. I don’t want to learn spanish! Do Tennessee public schools have a foreign language requirement? Oh, what a sweet smile on that lady with the “Speak English or Go Home” sign. Warms my heart. Who turns up at a rally where they are likely to be photographed in ill-fitting sweats? Katherine, they don’t want to speak anything but English, so the word “couture” is lost on them as well.